One of my favorite Hawaiian dishes is this one called squid lu'au. It's made by cooking lu'au leaves (young taro leaves) and squid in coconut milk until the leaves are tender. 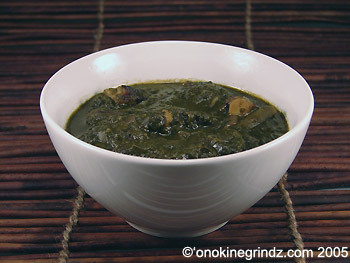 People often mistake this dish for baby food, but I think it almost looks like creamed spinach. The tender lu'au leaves and creamy coconut milk give this an irresistibly savory sweetness. If Hawaiian salt is not available, use kosher or rock salt. If lu'au leaves are not available, spinach is an acceptable substitute. Use approximately 1 1/2 to 2 cups fresh spinach leaves. Fresh squeezed coconut milk/cream is best. Start with about a half cup, add more based on your personal preference. Depending on the natural sweetness of the coconut milk, you may not need to use sugar. If sugar is necesssary, start with one teaspoon. Lu'au leaves contain a high concentration of calcium oxalate which can cause intense irritation of your mouth, tongue and throat. This is why the lu'au leaves must be cooked for a minimum of an hour. If you don't like squid, chicken makes an excellent substitute. Use one boneless chicken thigh cut into thin strips. While the lu'au leaves are simmering, clean and cut your squid (or chicken) into thin strips. Set aside. When the lu'au leaves are done, drain, rinse and squeeze to remove excess water. Heat butter in a small heavy bottomed pot and gently sauté squid until almost cooked through (about 5 minutes). Add coconut milk, lu'au leaves and sugar to the pot and cook on low heat, stirring constantly for about 30 minutes. Dish into individual bowls and serve. To think that I've lived in Hawaii all my life and never had squid luau! - something to add on my list of must tries for winter break! Yum. Spinach and coconut sounds delicious. And squid too? Mmm..
Just beautiful! This is one of my favorite Hawaiian foods! It's a local favorite and an acquired taste. I really like the combination of flavors in this, but it's really not for everyone. A lot of folks actually enjoy the chicken version of this dish as well. It also works quite well with beef. Thanks! This is one of my favorite dishes as well. My favorite is probably opihi poke.